Class Screen is there, to have a representation for a pysical monitor where the capturing process (grabbing a rectangle of pixels from a screenshot). For Multi Monitor Environments it contains features to map to the relevant monitor. Since Screen extends class Region, all methods of class Region can be used with a Screen object. Be aware, that using the whole screen for find operations may have an impact on performance. So if possible restrict a find operation to a smaller region object (e.g. reg.find()) to speed up processing. id – an integer number indicating which monitor in a multi-monitor environment. It creates a new screen object, that represents the default/primary monitor (whose id is 0), if id is omitted. Numbers 1 and higher represent additional monitors that are available at the time, the script is running (read for details). Using numbers, that do not represent an existing monitor, will stop the script with an error. So you may either use getNumberScreens() or exception handling, to avoid this. Note: If you want to access the default/primary monitor ( Screen(0) ) without creating a new screen object, use the constant reference SCREEN, that is initiated when your script starts: SCREEN=Screen(0). Get the dimensions of monitor represented by the screen object. The width and height of the rectangle denote the dimensions of the monitor represented by the screen object. These attributes are obtained from the operating system. They can not be modified using Sikuli script. All region methods have to be used as reg.find(PS), where reg is a Region object (or a Screen or a Match object). If written as find(PS) it acts on the default screen being the implicit region in this case (mapped to the constant reference SCREEN). In Multi Monitor Environments this is the primary monitor (use the constant reference SCREEN, to access it all the time), that normally is Screen(0), but might be another Screen() object depending on your platform and settings. On the other hand this may slow down processing speed, because of time consuming searches on the whole screen. So to speed up processing, saying region.find() will restrict the search to the specified rectangle. Another possibility is to say setROI() to restrict the search for all following find operations to a smaller region than the whole screen. This will speed up processing, if the region is significantly smaller than the whole screen. Capturing is the feature, to grab a rectangle of pixels from a screenshot and optionally save it to a temporary file for later use with find operations: Screen.capture(). Each time, a capturing is done, a new screenshot is taken. There is an interactive variant Screen.selectRegion(), that just returns the position and dimension of the rectangle selected by the user interactively.. Note on IDE: Both features are available in the IDE via buttons in the toolbar. The Capture button will allow to interactively select the rectangle on the screen, whose pixel content is saved to the current script’s bundlepath and then inserted (as thumbnail or the generated filename) at the current edit position in the script. region – an existing region object. rectangle – an existing rectangle object (e.g., as a return value of another appropriate region method). text – text to display in the middle of the screen in the interactive mode. the path to the file (always a file in temp storage), where the captured image was saved. In interactive mode, the user may cancel the capturing, in which case None is returned. Interactive Mode: The script enters the screen-capture mode like when clicking the button in the IDE, enabling the user to capture a rectangle on the screen. If no text is given, the default “Select a region on the screen” is displayed. If any valid arguments other than text are specified, capture() automatically captures the given rectangle of the screen. If valid, a new screenshot is taken and the content of the selected rectangle is saved in a temporary file. The file name is returned and can be used later in the script as a reference to this image. It can be used directly in cases, where a parameter PS is allowed (e.g. Region.find(), Region.click(), …). text – Text to display in the middle of the screen. a new Region object or None, if the user cancels the capturing process. text is displayed for about 2 seconds in the middle of the screen. If text is omitted, the default “Select a region on the screen” is displayed. The interactive capture mode is entered and allows the user to select a region the same way as using the selection tool in the IDE. Note: You should check the result, since the user may cancel the capturing. text – text to display in the interactive mode. Works principally the same as the normal capture, but directly stores the resulting image to the specified location. The name spec need not have the .png ending. If the path specification is omitted, the imagefile is stored in the current bundlepath. In this case the imagename will finally be bundlepath/_name.png, where the leading underscore is an IDE convention to block the automatic deletion of images, that are not namely referenced somewhere in the script, at the time the script is saved in the IDE. … where screen is some existing Screen object. The args are according to the above parameter specifications of the two variants. The intermediate result of cmdCapture is a ScreenImage object, that holds the image internally as BufferedImage (accessible using ScreenImage.get()). If more than one monitor is available, Sikuli is able to manage regions and click points on these monitors. The base is the coordinate system (picture above), that positions the primary monitor with its upper left corner at (0,0) extending the x-direction to the right and the y-direction towards the lower boundary of the screen. 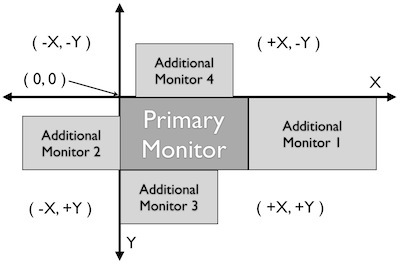 The position of additional monitors can be configured in the operating system to be on either side of the primary monitor, with different positions and sizes. So monitors left of the primary will have pixels with negative x-values and monitors above will have negative y-values (left and above both x and y are negative). At script start, Sikuli gets the relevant information from the operating system and creates respective screen objects, that have an ID (0 for the first or primary monitor, 1 and higher for additional monitors with a maximum of one less than the number of screens) and know the rectangle, they cover in the coordinate system. These informations are readonly for a script. These predefined screen objects can be accessed with Screen(0), Screen(1), … and are normally used to create your own screen objects. The possibility to use the region methods on a default region mapped to the primary monitor is implemented with the constant reference SCREEN. This concept is only available for the primary monitor. getNumberScreens() returns the number of available screens. getBounds() returns the rectangle covered by the default/primary monitor. Screen.getBounds() returns the rectangle covered by a screen object created using Screen(id). Be aware: Changes in your system settings are only recognized by the IDE, when it is started. Mac: The monitor, that has the System Menu Bar, is always Screen(0) and mapped to the default SCREEN. With its rectangle, a screen object is always identical with the monitor it was created using Screen(id). Using Region.setROI() to restrict the region of interest for find operations has no effect on the base rectangle of the screen object. On the other hand region objects and location objects can be positioned anywhere in the coordinate system. Only when a find operation or a click action has to be performed, the objects rectangle or point has to be inside the rectangle of an existing monitor (basically repersented by Screen(0), Screen(1), …). When this condition is met, everything works as expected and known from a single monitor system. a find operation will be carried out only in the part of region within the bounds of the monitor, excluding the area outside the monitor. a find operation will be restricted to the region within the bounds of the monitor that has a smaller id. An interactive capture (the user is asked to select an image or a rectangle via Screen.capture() or Screen.selectRegion()) will automatically be restricted to the monitor, where it was started. Region Across Monitors: the returned image will only cover the part inside the monitor with the smallest id. Based on the knowledge of your monitor configuration, you can now start some further evaluations using e.g. Region.hover() together with setShowActions(True) and highlighting using Region.highlight(). The implementation is based on the TigerVNC Viewer package and was initially contributed by Pepijn Van Eeckhoudt https://github.com/pepijnve. The intention of the following information is to only describe what is officially supported by a VNCScreen object aquired using vncStart(). For usage of the classes in the package itself you have to read the javadocs or look into the sources. To make the package more useable there are now highlevel wrappers, that hide the logic to create, start and stop the socket based connection. More than one connection can be used at one time, each represented by a different VNCScreen object. Start a VNC session to the given (usually remote) running VNC server and on success get a VNCScreen object, that can be used like a Screen object. About the restrictions and special features see the comments below. Stop the referenced VNC session, which closes the underlying socket connection and makes the VNCScreen object unuseable. mandatory usage someVNCScreen.stop(), where someVNCScreen is a VNCScreen object aquired before using someVNCScreen = vncStart(...). In basic operation environments there is no need to issue the vnc.stop() explicitely, because all active VNC connections are auto-stopped at the end of a script run or at termination of a Java run. Due to the current implementation concept of VNCScreen, Region or Location objects intended to be on a remote screen have to know this fact. Otherwise they are simply Regions and Locations on a local screen with fitting coordinates. This knowledge of being on a remote screen is internally propagated from one object to a new object created by a feature of the existing object. Hence in the beginning only the created VNCScreen object knows about being on a remote screen. So to create Regions and Locations on the remote screen from scratch, you have to use features of VNCScreen. Due to the correct RFB protocol implementaion in TigerVNC Viewer, it may take some time (up to few seconds depending on line speed and remote screen size) to initialize the frame buffer content after connection start. So if you get problems with the first access to the remote screen content (capture, userCapture, find operations explicit or implicit), you should simply add an appropriate wait() after the vncStart(). Experiences in local environment with large screens: 2 - 3 seconds are sufficient. Not all documented Screen/Region/Location methods might work as expected due to implementation quirks. In case, feel free to report a bug (see comment above). The current implementation only supports a limited set of RemoteFrameBuffer protocols. The above described level of usage is successfully tested from a Mac OSX 10.10+ against a TightVNC server running on a Windows 10 64-Bit in the local network or both client and server on the mentioned Windows machine using the loopback IP (127.0.0.1). Based on the ideas and first implementation of Gergő Törcsvári https://github.com/tg44 it is now possible to capture images from an Android device in the IDE and run scripts the same way as with a local screen. You can wait for images to appear on the Android screen and act with taps, swipes and text input. Since the avarage latency for a search operation is about 1 second (varies with screen resolution, region size and device processor speed), this solution only makes sense for basic automation and testing, where speed does not matter. It can be used with devices and emulators with minimum Android version 4 and does not need rooting. A device has to be attached via USB (first tests using a WiFi connection where discouraging). Currently only one connection is supported. If more than one device is available, then the one is connected, that shows up in first place on the device list. The SikuliX IDE has a menu entry in the Tools menu, that lets you make some basic tests, to assure, that your setup will work. If you want to use this feature, you should be familiar at least with the basics of adb. The usage is similar to VNCScreen: you work with an ADBScreen object, that represents the device’s screen and in SikuliX terms is a Region that provides all search and action features. As far as possible the actions are transformed to Android actions: a click gets a tap and type/paste result in an input text Most mouse and keyboard actions will do nothing but produce an error log. Furthermore Android typical actions are available with class Region: tap, swipe, input, … and it is possible to issue device commands via exec. If used with a local screen, these features silently do nothing. With a standard setup, there is somewhere a folder containing a folder plattform-tools, that in turn contains the executable adb (Windows: adb.exe). In this case, specifying the absolute path to the folder containing the platform-tools is sufficient. In all other cases you must specify the complete absolute path to the executable adb. In the following adb-path is one of the above alternatives. Take care, that your Android device is attached via USB to your system and is setup as accessible (see Android docs). Now you might use the IDE’s Tool menu entry, to check, whether the device is found and accessible. Of course you might use your own script/program/solution to do that. AS already mentioned: The Java class ADBScreen is the implementation, that represents the Android device in SikuliX and has the features of a normal Screen object and bound Regions implemented to work towards the device. For Jython scripting there is a shortcut: adbscr = adbStart() or adbscr = adbStart("adb-path"). Now for the rest of your script/program the variable adbscr represents the attached device and allows to use the implemented features in the normal way as adbscr.someImplementedFeature(...). To close a connection to a device use adbscr.stop(). This is done automatically when a script/program ends.